The misery index was initiated by economist Arthur Okun, an adviser to President Lyndon Johnson in the 1960’s. It is simply the unemployment rate added to the inflation rate. It is assumed that both a higher rate of unemployment and a worsening of inflation both create economic and social costs for a country. A combination of rising inflation and more people out of work implies a deterioration in economic performance and a rise in the misery index. A very simple concept. Maybe it should be weighted, but that would bring in a lot of subjectivity. I bring this up because Christy Romer just suggested to Ben Bernanke that it was time for his “Volcker moment”. But what exactly was the Volcker moment? You could say it was the decision to bring the misery index down after it had climbed all through the 1970s under Burns and Miller. To do that, Volcker introduced “monetary targeting” after announcing that without monetary restraint inflation would not be brought down. The interest rate targeting “gimmick” just wasn´t helping anymore. But don´t think Volcker was a “monetarist” (just ask Friedman). In fact, on October 11, 1979, just a few days after the new policy was launched the WSJ quoted “a Fed official”, widely believed to be Volcker himself, who warned that “the central bank will continue to be unpredictable”. This Fed “official” was also quoted as saying: “Anybody looking for a rule of thumb is going to be frustrated…the central bank isn´t going to trap itself by following a rule”. Note that that´s more blunt (Volcker after all is big) but not otherwise different from what Greenspan laid out as his “communication strategy”: “I guess I should warn you, if I turn out to be particularly clear, you’ve probably misunderstood what I said”. Nevertheless, despite their peculiar “communication strategy” they succeeded. Volcker in bringing the misery index down and Greenspan in keeping it down! You see, the early Volcker years were the period when the Fed at least claimed to have become monetarist, to be setting targets for monetary aggregates like M1 and M2 rather than interest rates. It didn’t last long; by the summer of 1982 the Fed had more or less thrown out the monetarist playbook. Yet the monetarist interval served a purpose: it gave the Fed a usefully euphemistic way to talk about its inflation-fighting strategy. Officials didn’t have to say, “We’re going to push the economy into a deep recession, and keep it there until inflation cries uncle.” Instead, they could talk in terms of M1 growth rates and credible long-run strategies and whatever, while in fact what they were basically doing was pushing the economy into a deep recession and keeping it there until inflation cried uncle. Nominal GDP targeting is quite a lot like that. To be sure, NGDP is a much better target than M1, which (it turns out) is subject to wide swings in velocity. And the Fed’s goals, if frankly stated, wouldn’t be nearly as politically explosive as what it was doing in 1979-82. Still, NGDP is arguably mainly a relatively palatable way to state a strategy that’s ultimately about something else. As I see it — and as I suspect many people at the Fed see it — the basic point is that to gain traction in a liquidity trap you must either engage in huge quantitative easing, raise the expected rate of inflation, or both. Yet saying this is very hard; people treat expansion of the Fed’s balance sheet as horrible money-printing, and as for the virtues of inflation, well, wear your body armor. But say that we need to reverse the obvious shortfall in nominal GDP, and you’ve found a more acceptable way to justify huge quantitative easing and a de facto higher inflation target. Don’t call it a deception, call it a communications strategy. And as I said, I’m for it. With regards to NGDP targeting Krugman is being a bit too cynical, but I won´t quibble with that here. There will be a two day meeting of the Federal Open Market Committee (FOMC) this coming Tuesday and Wednesday. I expect no changes to the Fed Funds rate, or to the recently announced program to “extend the average maturity of its holdings of securities” (scheduled to end in June 2012), or to the program to “reinvest principal payments from its holdings of agency debt and agency mortgage-backed securities in agency mortgage-backed securities”. There might be some other minor upgrades, but overall the statement will probably be pretty similar to the September statement. Does anyone see an academic like Bernanke saying the things Volcker or Greenspan said? I don´t! This paper examines the role of aggregate demand stimulus in ending the Great Depression. A simple calculation indicates that nearly all of the observed recovery of the U.S. economy prior to 1942 was due to monetary expansion. Huge gold inflows in the mid- and late-1930s swelled the U.S. money stock and appear to have stimulated the economy by lowering real interest rates and encouraging investment spending and purchases of durable goods. The finding that monetary developments were crucial to the recovery implies that self-correction played little role in the growth of real output between 1933 and 1942. The recent recession was obviously not caused by tight monetary policy. Interest rates were not especially high when it began, and so the Federal Reserve had only limited room to cut them. It has brought short-term rates down to virtually zero, but it cannot push them below that. The result is that we have not had the strong monetary stimulus that we would normally have in these economic circumstances. One study found that given the Federal Reserve’s usual responses to inflation and unemployment, economic conditions would lead it to cut its target for the federal funds rate by an additional 5 percentage points if it were able to do so. The combined result of the policies that we have taken, the inherent resiliency of the American economy, and the headwinds that we face, is that we are growing again, but not booming. 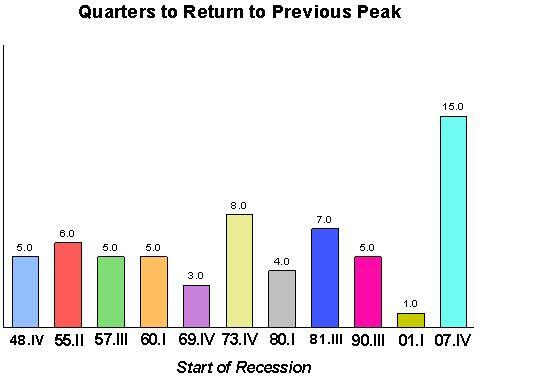 GDP is rising at a solid pace, but not as quickly as after other severe recessions and not as quickly as it needs to. As a result, the unemployment rate remains painfully high and is not predicted to reach normal levels for an extended period. That is, despite the very low level of interest rates and all the attention to the growth of the Federal Reserve’s balance sheet, current monetary policy is in fact unusually tight given the condition of the economy. She falls right into the trap of appealing to interest rate levels to define the stance of monetary policy. While “low” rates in the first paragraph indicate that MP was not tight, even lower rates in the last paragraph indicate MP is tight! The President and his economic team see a key role for targeted actions. There are fiscally responsible measures we can take that can make an important difference between so-so recovery and strong recovery; between stubbornly high unemployment that falls only very slowly and unemployment that is on a steady downward trend. And 18 months later, despite all the “targeted actions”, employment is still depressed and unemployment uncharacteristically high. But once “outside the loop” her mind opens and she begins to give good advice! the significance of Paul Volcker’s appointment was that he was one of the rare individuals tough enough and with sufficient foresight to do what had to be done. So maybe we´re all set for NGDPT? Unfortunately no unless, much like Christy Romer in her NYT article, if instead of Fed Chairman, Bernanke was still just a Princeton professor like he was when he gave good advice to Japan. We hear that the Fed is set to spend a lot of time Tuesday and Wednesday “wrestling with communication policy”. There is no way programs like QE2 or Operation Twist will have lasting power if there is no explicit and well understood target assigned to them. So, instead of “wrestling” with communications policy, the Fed should “wrestle” to establish a TARGET. I would go further and say that if it doesn´t have a (explicit) target, it should not bother “wrestling with communications policy”. That would likely make things worse! Why do I say that? Just look at the Greenspan record. In terms of the Fed´s mandate (stable prices and maximum employment) he was the most successful Fed chairman. Obviously they are one and the same. And Greenspan must have lied when he said “since becoming a central banker” because he only became a central banker in mid 1987. No way he could have developed that “communication strategy” in just a few weeks. It must have always been in his “DNA”. But the markets adapt quickly. Soon a bunch of intelligent and handsomely paid people – Fed watchers – were hard at work endeavoring to translate into lay teems Greenspan´s “incoherent mumbles”. The stock market crash of October 1987. The Dow dropped 22% in one day. The fall of the Berlin wall and breakup of the Soviet Union. We think the best bet lies in a framework known as inflation targeting, which has been employed with great success in recent years by most of the world’s biggest economies, except for Japan. Inflation targeting is a monetary-policy framework that commits the central bank to a forward-looking pursuit of low inflation—the source of the Fed’s current great performance—but also promotes a more open and accountable policy-making process. More transparency and accountability would help keep the Fed on track, and a more open Fed would be good for financial markets and more consistent with our democratic political system. Not only did it not work but made things worse because he did not (or was not able to) make his preferred target explicit. While just a few years earlier, following the 2003-05 oil shock, Greenspan “mumbled” about “appropriate monetary policy”, Bernanke tried to “be clear” about his intentions. But that proved to be an impossible feat given there was no explicit target to assign his actions to. Even worse, Bernanke implied the FOMC was “eyeing” headline inflation. That was akin to “throwing salt into the wound”. The consequences were terrible, with the economy “rehearsing a replay of the 1930´s”. The next question is: which target? Market Monetarists have been clear about their preference for a nominal spending level target. In a very recent post Scott Sumner explains and contrasts NGDPT with the alternative of a “NGDP futures contract price targeting”. On the other hand, Bernanke is a big fan of inflation targeting. I hold the view that inflation targeting, if chosen, would be a bad choice. Without going into details (see here for a discussion) I just mention the fact that inflation cannot be a good target, once it has been brought down, because if it were we would not observe the gatherings in myriad seminars and the dozens of papers written in the last 10 or 12 years, coinciding with the “conquest” of inflation in many countries, on the subject of “How to conduct monetary policy in a low inflation environment”. To me this implies that when inflation has been brought down somehow monetary policy has to be “adapted”. But since monetary policy is clearly determined by its goal or target, the target has to change. The reason for the discussion on MP in a low inflation environment has to do with the problem of the ZLB on the policy “instrument” – the FF rate. This point is consistent with the suggestions made by some (Blanchard, Rogoff, for example) that the Fed should rise, even it temporarily, the inflation target. Again, the problem is the US does NOT have an explicit target! And that, folks puts the Fed in a situation akin to the “dog running in circles to grab his own tail”. It´s going nowhere! Update: While I was engrossed in writing I got an e-mail from David Levey linking to this NYT comment by Christina Romer! I see that Lars Christensen has also linked. Klaus Regling, the chief of the European Financial Stability Facility, has arrived in Beijing a day after Eurozone leaders struck a last-minute deal to contain the bloc’s debt crisis. European leaders are now under pressure to finalise the details of their plan to slash Greece’s debt burden and strengthen their rescue fund. Mr Regling, who is due to meet officials from China’s central bank and finance ministry, said he wanted to hear how the European Financial Stability Facility (EFSF) could structure investments to attract funds. “That’s also my experience talking to the Chinese authorities that they are interested in finding attractive, solid, safe investment opportunities. And I am happy that EFSF bonds have been considered to be in that category in the past, and therefore I am optimistic that we will have also a longer-term relationship because we will continue to provide safe, attractive investment opportunities,” he added. But there’s really not much one can say about this idea reported in the Telegraph, other than: this is really stupid. The whole Eurozone problem is that each Eurozone country was issuing bonds in what was effectively a foreign currency, and so it lacked an effective lender of last resort. Now, if the Telegraph is correct, the Eurozone as a whole is planning to repeat the mistake, and become just like Greece. European leaders’ agreement to expand a bailout fund to stem the region’s debt crisis only buys time as Greece will likely still leave the euro in the next decade, Harvard University economist Kenneth Rogoff said. Playing it safe because in 10 years time there´s an 80% chance that the whole Eurozone, not just Greece, will not be there anymore! Of course, today’s mess was many years in the making and there is no easy, painless exit strategy. But the need to introduce more banking discipline is yet another reason why the policymakers must refrain from excessively expansionary macroeconomic policy at this juncture andaccept the slowdown that must inevitably come at the end of such an incredible boom. For most central banks, this means significantly raising interest rates to combat inflation. For Treasuries, this means maintaining fiscal discipline rather than giving in to the temptation of tax rebates and fuel subsidies. In policymaker’s zealous attempts to avoid aplain vanilla supply shock recession(! ), they are taking excessive risks with inflation and budget discipline that may ultimately lead to a much greater and more protracted downturn. The GDP release was cause for some “celebration” due to the fact that, finally, RGDP regained the level of the previous peak. However, in per capita terms, it´s still about 2.5% below! Assuming that trend (potential) real growth is something around 2.5% from 2007 onwards, the level of RGDP now, absent the “crisis”, would be close to 14.7 trillion or 9.7% higher than the 13.4 trillion observed! A long and contentious debate on communications is set to occupy most of the Federal Reserve’s time when it meets on Tuesday and Wednesday next week… Three different issues are tangled together. The first is whether to clarify the Fed’s goal by agreeing on a clear inflation objective. Second is explaining how the Fed is likely to change policy in the future to reach that goal. Third is whether to use communication to ease policy now with, for example, a pledge to keep rates low until unemployment falls to 7 or 7.5 per cent. A working group is attacking the problem from first principles, with every option – including innovations such as setting a target for growth in nominal gross domestic product over time – up for discussion. U .S. monetary policy has been remarkably successful during Alan Greenspan’s 121/2 years as Federal Reserve chairman. But although President Clinton yesterday reappointed the 73-year-old Mr. Greenspan to a new term ending in 2004, the chairman will not be around forever. To ensure that monetary policy stays on track after Mr. Greenspan, the Fed should be thinking through its approach to monetary policy now. The Fed needs an approach that consolidates the gains of the Greenspan years and ensures that those successful policies will continue—even if future Fed chairmen are less skillful or less committed to price stability than Mr. Greenspan has been. Faultless and the kind of statement about which Nick Rowe would shout “Bulls…eye”, except for the fixation on “inflation targeting”, but that´s another story. Now it just so happens that right now money is tighter than when interest rates were 8% in the 1970s, but you me and about 23 other people are the only humans on the planet who realize that. Hence it seems like I’m proposing Zimbabwe, whereas I’m actually proposing a monetary policy far tighter than the one implemented by Paul Volcker. And that’s one of many reasons why we are where we are. Will the Fed come around to that idea next week? Very unliklely! The Eurozone core weakness has been known since the beginning – the separation of monetary and fiscal policy. This is the principle upon which the European monetary union was built, but the crisis made it clear – without a central bank acting as lender of last resort, highly indebted countries are too vulnerable to changes in market confidence. Unless this central problem is addressed, the crisis is unlikely to reach a turning point. A turning point in the setting of monetary policy is needed to restore confidence. Financial stability should become at least as important as price stability as a guiding principle for monetary policy decisions. Accordingly, the ECB should cut interest rates and announce the intention to sustain the price of the bonds of the Eurozone governments, unless their public finances are truly unsustainable. A depreciation of the euro would help relaunch the economy – something that would be welcome now that themain risk is a new recession and certainly not inflation. This is the current monetary policy of the other major economies. The economic situation would require the same approach in the Eurozone. This turn in monetary policy is not necessarily incompatible with the European treaties, given the exceptional nature of the crisis, but it is surely against the prevailing opinion in Germany. And this is not only a political problem. Should the ECB challenge German public opinion, adopting a monetary policy deemed by Germany to be in contrast with the founding principles of the monetary union, the euro would be exposed to serious risks. Currencies, like debt, are based on trust. However, with deep contrasts on monetary policy, we do not know how long trust in the euro would last. This is the underlying reason why this European summit has proven so difficult. Many realise that the contagion could reach France and that this crisis will not come to an end without a radical reset of monetary policy goals. Yet, the country that more than any other has foregone monetary sovereignty would consider this turn a betrayal. If this analysis is correct, this outcome of this summit is unlikely to be decisive. The crisis will last for long. We have to wait for German public opinion to realise that the euro was built on imperfect foundations and that these imperfections must be corrected. Meanwhile, the Italian president of the ECB will need all his technical and political expertise to keep the boat afloat. Read the the whole post. It´s very rewarding and fun! The day may yet come when the eurozone finally agrees a comprehensive package to end the crisis, but this was not the day. What policymakers agreed at 4am Brussels time on Thursday came close to what they set out to do. They secured a “voluntary” deal with the banks, and they agreed the outer perimeters of a system to leverage the European financial stability facility. But none of this is going to end the crisis. European Union talks with banks on bondholder losses as part of a second Greek bailout ran aground, dimming the chances for a comprehensive strategy at a summit to stamp out the debt crisis. Over the last 21 months, the Eurozone held 14 summits! That´s about one every six weeks. The conclusion is always the same. The need for another summit and some more talk! But the fabric that holds the Union together is fraying. Who would have imagined, just a few years ago, that little Greece could pull the “Euro house” down? 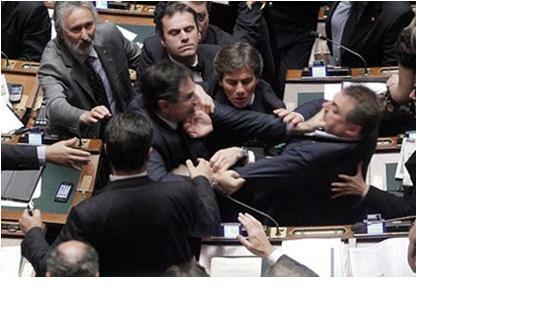 Update: While in Brussels discussions proceed, apparently in civil fashion, in the Italian Parliament politicians trade punches over raising the retirement age. I bet that looks more like what the people in Brussels really feel like doing.